Japanese startup Astro Live Experiences (ALE) is working on a project that could launch the world’s first artificial meteor shower. The Tokyo-based business is building two micro-satellites which will launch hundreds of tiny pellets that will replicate shooting stars across the Earth’s atmosphere. The price of an artificial meteor shower has not been disclosed, but ALE founder and chief executive Lena Okajima hopes to make the shows accessible to the entire world. The company is planning to use two micro-satellites to release light-emitting balls in space. The first micro-satellite will be launched attached to a rocket from Japan’s space agency in March 2019. The second will be launched in mid-2019 on a private-sector rocket. The satellites will only be able to stay in space for around two years. Each satellite will carry 400 tiny balls, enough for around 20 to 30 artificial meteor showers. The balls will glow brightly once they enter the Earth’s atmosphere. The chemical composition of the balls is proprietary, but the company did say that it would be able to modify the colors. What those colors would be has not been disclosed. Each star is expected to last at least a few seconds, lasting longer than most meteor showers. 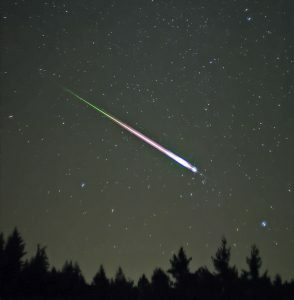 In clear skies, the artificial meteors could be seen over a 124 mile range. ALE is already in the final stages of developing the technology. According to a statement from the company, ALE plans on spending $20 million on the entire operation.